SiWen was sleeping soundly when the mosquito netting surrounding her bed caught fire from the spark of a nearby gas lamp. The lighted netting fell atop her as she slept; the synthetic material badly burning her upper body. China's medical system is based on a "fee for service" model: each surgery, prosthesis, and IV bag incur a cost. After getting SiWen the most basic care to ensure her survival, her impoverished family could not afford any further surgeries or rehabilitative therapy. 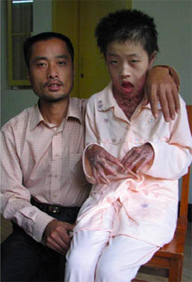 As SiWen continued to grow, her bones and tendons expanded but her scarred skin could not, resulting in painful and debilitating contractures of her hands and neck. Today, SiWen is making amazing strides, with major surgeries to her very contracted hands and lots of rehabilitation therapy during HandReach's first annual Psychosocial Camp/Clinic in July 2010. 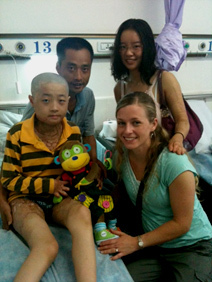 Child Life specialist Jessica Irven was on hand with Zhou Lin to help SiWen get ready for surgery and rehabilitation at the XiaoFang Firefighters' Corps Hospital in Changsha, China.